Hi everyone! I guess it's been long since the last time I posted something here. 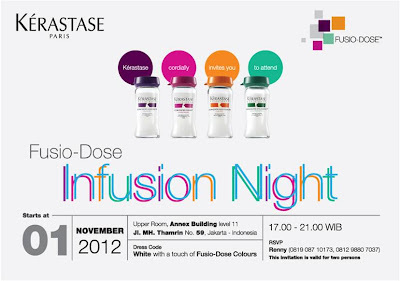 Last Thursday, on 1 November 2012, I got the invitation to Kérastase Fusio-Dose Infusion Night. Actually, I planned to go with my friends, but as usual, in the end, none could make it that night (yeah, sometimes it's annoying when your friends cancelled appointment during the last minute, bla bla bla *insert reasons here*). OK, enough whining. When I arrived, it was only Yessy and her friend in the press room. Hoho, enjoyed a very nice pudding and lemon tea (my favorite!). 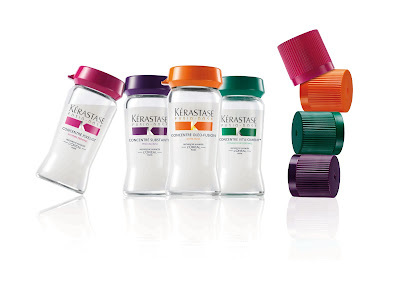 In brief, Kérastase introduced FUSIO-DOSE, a technological series of concentrate and booster with highest certaint active ingredients which formulated to directly solve both primary and secondary hair problems with instant result (OK, what a long sentence). So the technoloy series of FUSIO-DOSE has 16 combination of specific concentrate and booster created to solve various hair problem. Through daily essential hair care treated by salon professionals, Indonesian Kérastase women can get diagnosed and choose their own combination of FUSIO-DOSE according to their needs. After the press conference was over, then we headed to the party. But, first I wait for my hair diagnose since I was late. The examiner then told me that I have brittle hair as primary problem and since I colored my hair a few times, my secondary problem is dull hair resulted from the coloring process. So I got green concentrate and red booster. See the guys on the left, they dressed like Korean boyband personnels right? I was wearing my old Aigner fruits dress (which I rarely wear because I'm too afraid of being to 'crowded') and my pink heels (not shown on the pictures). I just wear minimal make up with natural-color eye shadows and lip stain. After a few chews and drinks, the Infusion Night started. It was the same people and same talks as previous press conference (~_~). 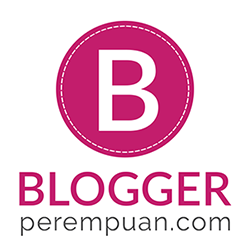 Oh, not to forget that I met other fellow beauty bloggers that night; Shella, Nita, and Ci Carnellin. 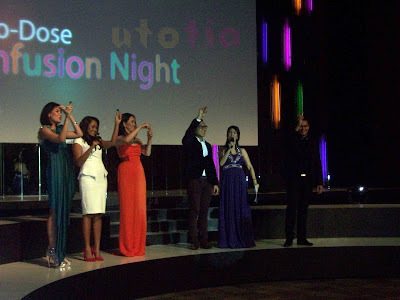 But, this time, there were some public figures whom I think are the brand ambassadors; Sigi Wimala and Maya Hasan. They were talking about how Kérastase, especially FUSIO-DOSE has helped them. Then the event continued with the infusion together along every person in the ballroom that night. So, it came to surprise that there's a pair of FUSIO-DOSE concentrate and booster under everyone's chair! But, yes, there was small incident, a few minutes before the infusion. Few people beside us started to make a noise, and what I mean by noise, is a really big fuss. Turned out that they stole the FUSIO-DOSE under others' chairs, including us. Fortunately enough, Kérastase provided additional FUSIO-DOSE for everyone who hasn't got the products (stolen like us). After that, then the official launch of FUSIO-DOSE were followed by the dance presented by 4 dancers, each representing the color of FUSIO-DOSE. 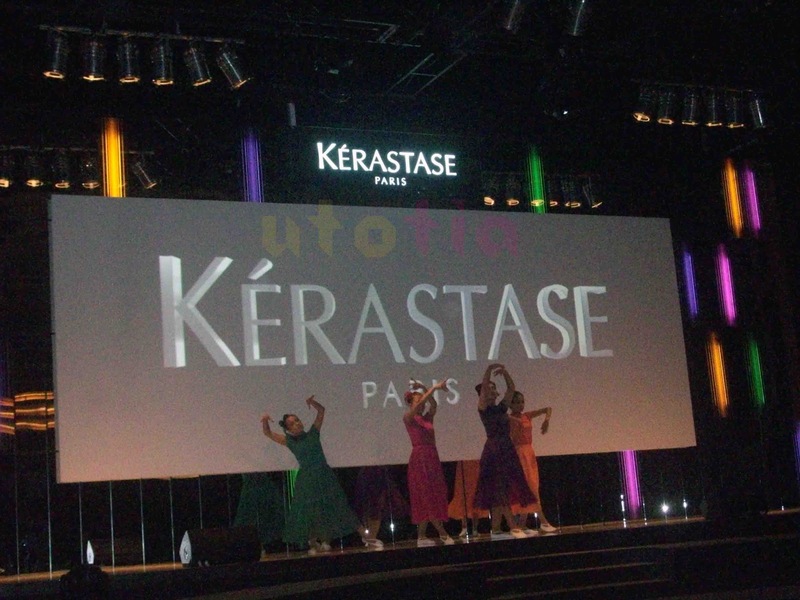 And there were a hair show by the hair salon sponsored by Kérastase. 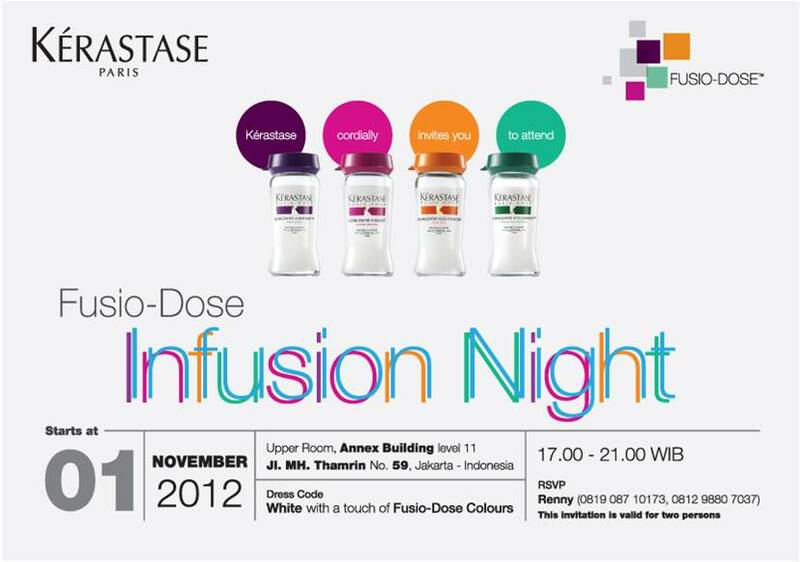 one package of FUSIO-DOSE, a jar of candies, and a gift voucher of free FUSIO-DOSE hair infusing ritual at IRWAN! 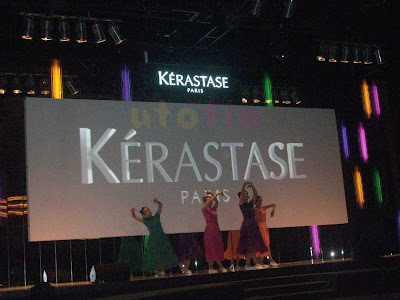 Thank you Kérastase for a nice FUSIO-DOSE Infusion Night, will definitely try the hair infusing ritual soon!